In a video released by the Canadian Space Agency and NASA, Canadian astronaut Chris Hadfield explains how he cuts his fingernails on board the International Space Station. Life in space isn't easy. Even basic hygiene, like clipping your fingernails, is a cosmic challenge without gravity, one astronaut says. A new video by Canadian astronaut Chris Hadfield shows exactly how complicated (and a little gross) it is to cut your nails in the weightless environment of space. Hadfield currently lives on the International Space Station, where astronauts are forced to devise inventive ways for dealing with basic bodily needs that many folks may take for granted on Earth. "Now, if I just cut my fingernails here, fingernail bits are going to fly everywhere," Hadfield explained in the zero gravity nail-clipping video as he floated about inside the space station. "They won't fall to the ground. You can't sweep them up. They'll float everywhere. They get in your eyes, people breathe them. Not good. Got to figure out a plan." 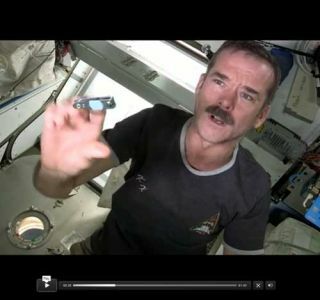 Hadfield's solution is to position his hand over an air duct where air is pulled in and filtered throughout the station. The nail clippings get sucked into the duct's mesh filter, making cleaning up relatively simple. "So, there we go," Hadfield said. "Nails are ready for guitar playing. I'm going to vacuum this [the air duct] later in the week. It'll all clean up just fine." There are many other ways astronauts tackle daily life without the pull of gravity. They attach strips of Velcro to all of their belongings since anything that isn't tied down can float away and get lost somewhere inside the International Space Station, which has the same habitable space as a five-bedroom house. The astronauts share hair-cutting duty with their crewmates, using a vacuum to clean up clippings after each snip. A complicated procedure using hoses and airflow allows astronauts go to the bathroom in space . There are two toilets for the six astronauts living on the space station today. Hadfield is a flight engineer representing the Canadian Space Agency on the station's Expedition 34/35 crew. Two American astronauts and three Russian cosmonauts round out the team. In March, Hadfield will take command of the station's Expedition 35 crew, to become Canada's first space station commander. Hadfield has already developed a reputation for snapping amazing photos of Earth from space, writing and performing songs in space on the guitar, and Tweeting with celebrities like William Shatner, "Star Trek's" famed Captain Kirk, since arriving on the station last month.